There is so much Halloween goodness hitting the grid at the moment that it is incredibly difficult to keep up! However, it’s a Wednesday, and I haven’t posted a Witchy Wednesday in ages, so I’m going to feature an absolute corker for you today. Watch out for tons of Witchy related activity, spooky surprises and ghostly goings on in every corner of the grid, with hunts, events and sales galore celebrating the Halloween theme. Be wary and wise by making sure that your eyes are glued to the blogosphere for news on the latest events. I also recommend keeping at least one eyeball fixed firmly in a Mad-Eyed Moody style on Elysium Hyne’s Pinterest boards. Ely seems to moonlight as a pinning whirlwind and is doing a great job of keeping a record of all the festivities. 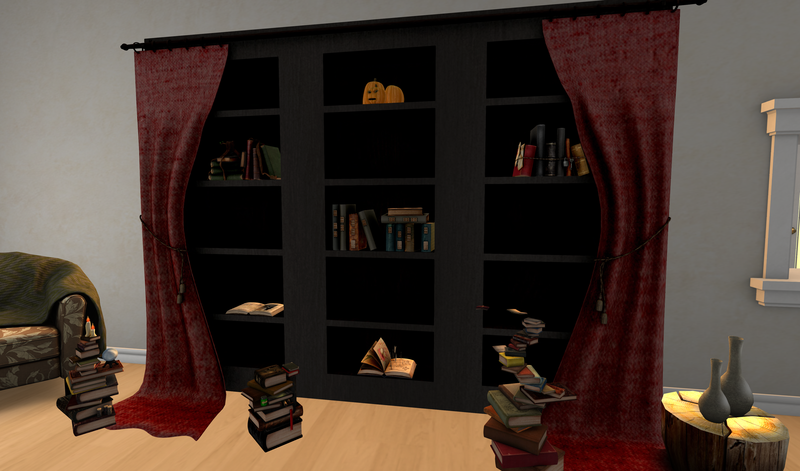 Last but not least, Seraphim SL offers a myriad of event catalogues that are well worth a browse. So let me tell you about The Wizarding Faire 2013. This has been going on for a while already and is due to end on the 20th, but it’s an absolute must-see! (I realise I am late to the blogging party on this one, and I’m playing catch-up. Real life, what can I say?) The Wizarding Faire is of course a celebration of all things ‘teenage boy-Wizard’ related, but even if you aren’t a fan of the series of books this event is styled after you will still find lots of interesting items on sale, with some of them more Witchy than others. There are 48 designers in attendance, and each one has contributed something very special. Gachas, clothing, poses, furniture, the list is endless. Not only that, the sim is beautifully designed and fabulous for visiting and taking tonnes of photographs. Look, you know it’s going to be special when you have to open a wall of rocks to step inside! I spent a happy hour here exploring and shooting pictures and buying lots of nice things.. 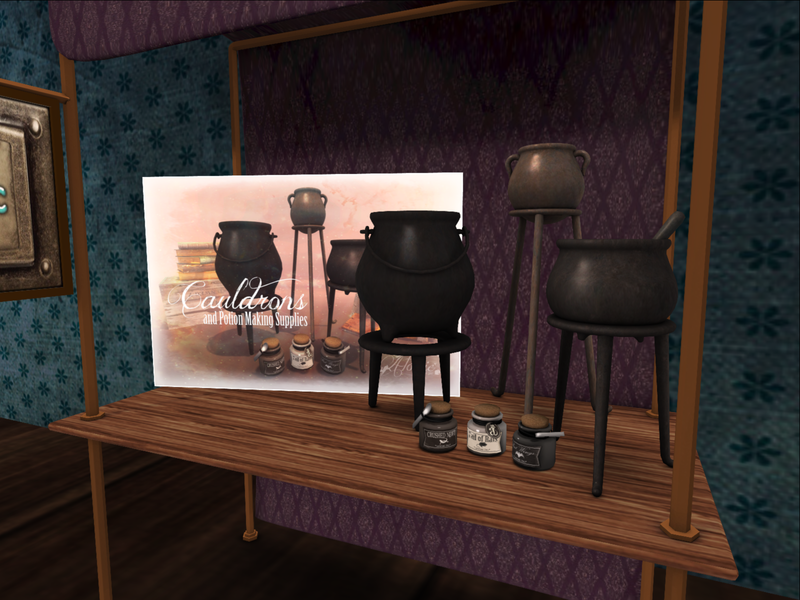 I absolutely fell in love with the ATOMIC cauldrons and potion-making supplies. Ivy Graves is a veritable mesh Goddess, and these look fabulous. They’re a great shape, a little different to the cauldron norm and are beautifully textured to perfectly capture a worn feel. The little jars of essential spell making ingredients really look the part too. Love it! I also need to give a shout out to LARK as well, because Sienia has done it again. ‘It’ being making mesh magic all on her own. I am constantly blown-away by the work that Sienia does. 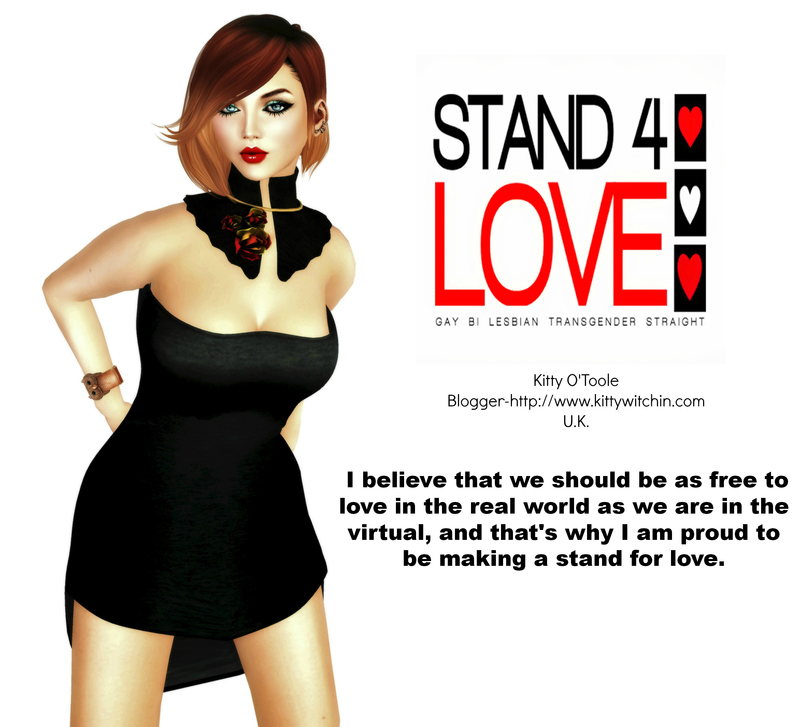 She is blessed with a talent for great design, teamed with an astonishing imagination making Sienia’s creations an important force in Second Life design. You’ll find lots of clothing items at the event. It’s well worth checking out the astonishing Damien Fate’s FATEPLAY label because not only will you find some fantastic clothing, but also the BEST mesh Witch Hat, called ‘Damadore’, that I’ve yet seen on the grid: nice and plain and simple and best of all A FREEBIE! Whoop! There is so much to enjoy at The Wizarding Fayre. It must be said that the team behind this event have produced a corker; rather than fill it to the brim with items that are of dubious quality, each item is a winner. There’s just enough to enjoy with bucket-loads of original mesh items to splurge upon, and the environment is, excuse the pun, simply enchanting. It stands up so well to repeat visits with so much to enjoy. In a grid that is often teaming with events and occasions it takes just one quality themed event to truly show how it’s done, and The Wizarding Fayre meets that brief head-on. I’m NOT going to blog all of it in the hope that this will encourage you to fly on over there and see for yourself. Check out the list of designers below, how could you not want to visit knowing these guys are taking part?! As a final nudge to elbow you over to Diagon Alley, I must tell you about the frogs. 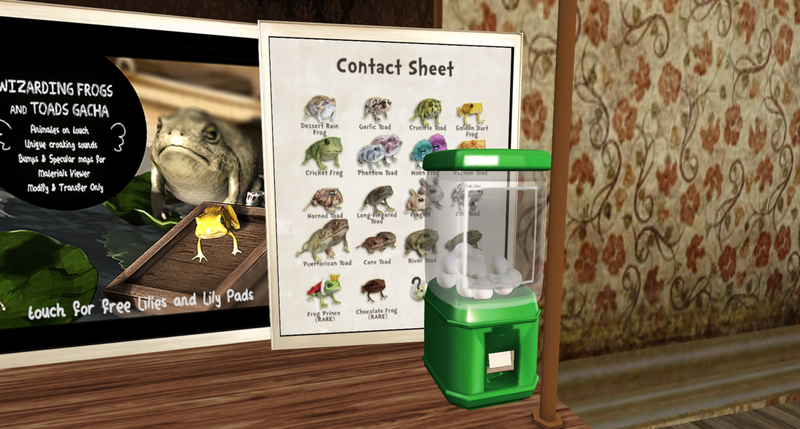 Yup, it’s full of every kind of frog to fulfil all your ribbety needs! What drew me to it was the inclusion of the Desert Rain Frog, which is featured in THIS video, which I love. But readers, they are all equally fabulous. I’ve bought a few of these to decorate the landscaped areas at my new home (more on that coming soon!) and each one of them is an absolute joy to behold. They’re beautifully created and textured, and I have no idea how BEETLEBONES has crafted them, but I am so pleased that they did! They’re AWESOME. Oh, and yes, Gacha prizes. Damn those addictive things! And if you like my broom, this was a group gift from Dutchie this month, and it is great fun! I’m practically already set for Halloween! 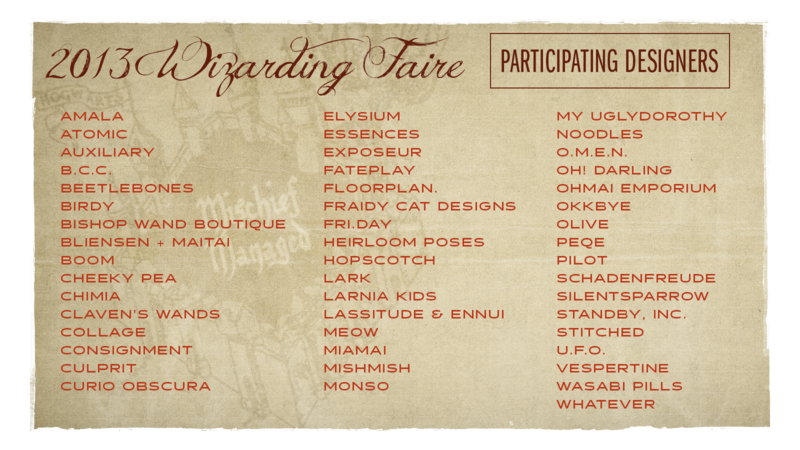 See you at The Wizarding Faire!